Had your picture taken with Santa & Mrs. Claus? Find and download your complimentary portrait* here! You can find your Gallery # on the slip of paper you received at the Roll & Stroll. *The free download is great for sharing online or printing a 4×6″ print. You’ll also have the opportunity to purchase larger prints, and all the proceeds go to Arts For Life’s art lessons for pediatric patients! Capacity limited to the first 1,000 registrants. We invite you to bring art, music , and poetry lessons to patients and families at Brenner Children’s Hospital by creating a Roll & Stroll fundraising page! Is there a better feeling than helping put a smile on the faces of kids and teens who need it the most?? Amazing prizes for the top SOLO (individual) fundraiser and for the top TEAM fundraiser. For example: the top TEAM fundraiser will win an awesome prize package from Roll & Stroll sponsor Mast General Store, valued at over $1,000! All generously donated by Mast General Store, so you can rest assured your funds raised will go right to supporting children and teens in the hospital. Depending on how much you raise, you earn some pretty great Roll & Stroll prizes – like t-shirts, sweatshirt hoodies, fleece, and more. You can rock your Roll & Stroll pride all winter long! More details soon. New This Year: Early Packet Pick-Up! On Wednesday, November 16, you’ll be able to pick up your registration packet in advance, so you won’t have to wait in line to check in at the event. Your packet will include your wristband, event program, and other important details, plus lots of great swag. BONUS: if you are an early packet picker-upper, you’ll earn a free raffle ticket for a chance to win our Huge Raffle Prize! 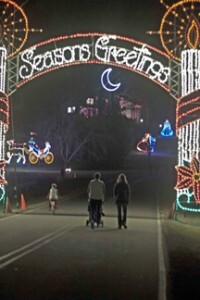 New this year: just under 2 miles of twinkling holiday lights! This year, we’re starting and ending at the Pool Parking Lot. 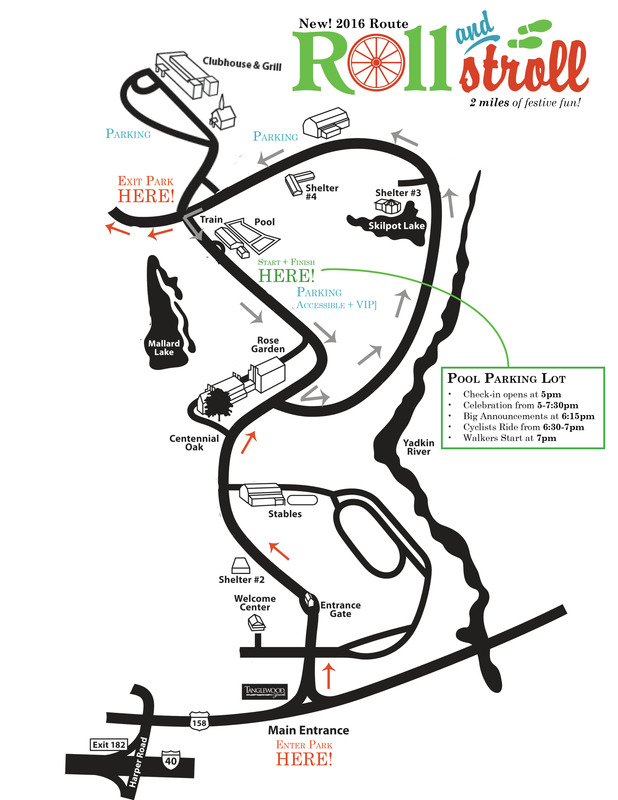 To park, go in the main entrance of Tanglewood Park (Hwy. 158) and head straight for the guardhouse. Keep going straight (while oohing and aahing over the lights as you drive through) and you’ll be directed to one of three convenient parking lots. If you’re riding a bike, you’ll get the route to yourself from 6:30-7pm. We’ll have a ride leader for you to follow as you take a few spins around the route before putting on the brakes by 7pm to make room for walkers. If you’re walking, pushing a stroller, pulling a wagon, or accompanying kids on bikes, you’ll enjoy the route starting at 7pm. You must be in the park by 6:00pm! This will give you and yours plenty of time to park and get settled for the kickoff show, fun and games, food and drink, visits with Santa, and more. Allow MORE time if you haven’t preregistered – but we anticipate a sellout crowd this year, so preregistration’s a great idea! (All Roll & Strollers need to begin walking by 7:30pm). The celebration in the Pool Parking Lot closes at 7:00; the course closes at 9pm. Your most festive holiday wear! PRIZES go to the Most Festively Dressed person and the Best Decked-out Bicycle. And, bundle up – layers are your friend! If you have a wagon, pile it up with blankets – better to be warm than sorry. We are totally sure that the weather will be delightful on November 17! but this is a RAIN or SHINE event, with no alternate date. In the case of extreme weather conditions, check back here for cancellation notice. Besides yourself, your friends, your kids, your friends’ kids and your kids’ friends? Warm layers, gloves, hats – we covered all that already, but it bears repeating! We’ve got a shorter, safer, and overall better route for you this year! It’s on a Thursday night this year! Mark your calendar: Thursday, November 17. Bikers: we’ll have a designated Ride Leader for you to follow, to make it a more community-oriented “group ride,” and learn more about other opportunities throughout the year to ride socially in the Triad. Feel free to go at your own pace – but follows the rules of the road! How else can I help??? We’re so glad you asked! We need more than 80 volunteers to make sure this event goes off without a hitch. A chance to enjoy the Festival of Lights yourself! Click here to choose and sign up for your volunteer spot TODAY. Grab some friends or your officemates and sign up to be on the same team, to make it a bonding, do-good holiday experience. 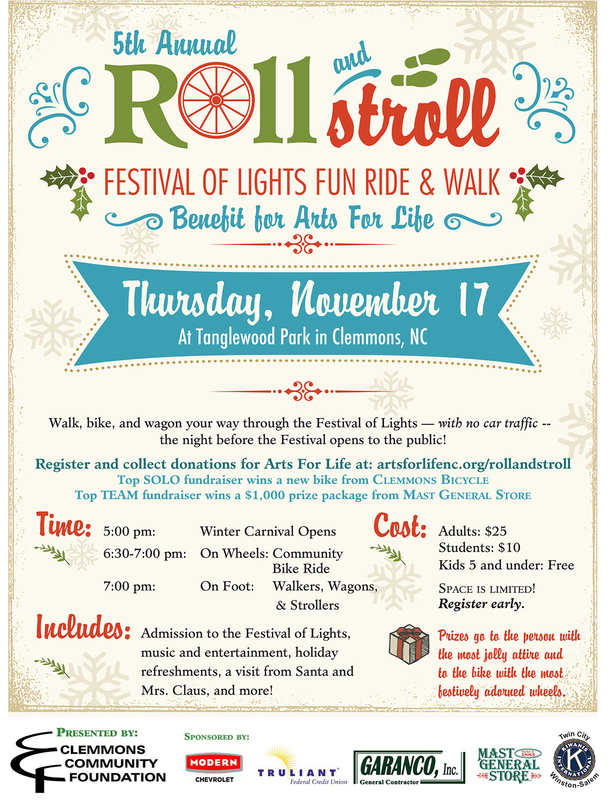 You can buy tickets for $20 each at the Roll & Stroll, AND if you decide to pick up your packet early on Wed., November 16 (see above), you’ll earn 1 free raffle ticket.